After falsely claiming a victory at the Supreme Court of Nigeria, Chairman of Innoson Motors, Dr Innocent Chukwuma has deleted his declaration on social media that the apex court has ordered GTBank to pay him N14bn within 14 days. The retraction, judicial analysts believe, was advised by Innoson’s lawyers who fear that contempt of court charges on defaming the Supreme Court may be brought against the embattled businessman. 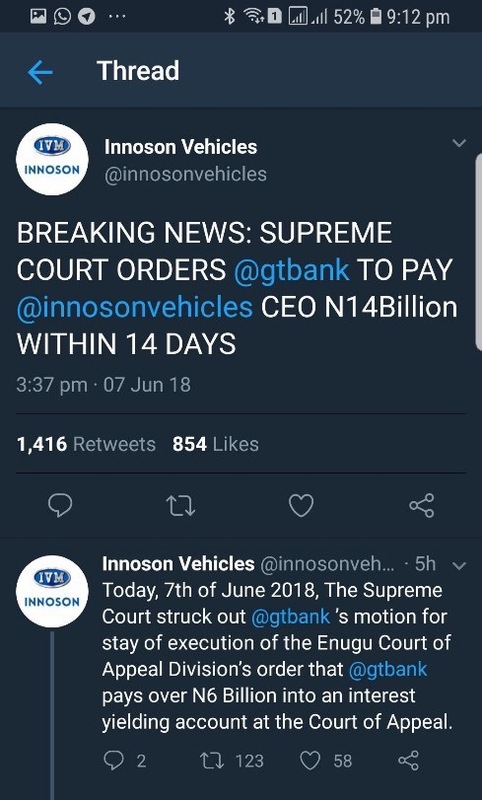 Innoson had earlier on Thursday caused a social media storm by claiming that Supreme Court had ruled in his favour for GTBank to pay him N14bn. However, records of the court proceedings showed no such ruling. Instead, what the Supreme Court had directed was for both parties, Innoson and GTBank, to return to the Court of Appeal, Enugu Judicial Division, for a hearing on GTBank’s appeal scheduled for the 14th of June 2018. In fact, it is in the tradition of the Supreme Court to issue definitive rulings only on Fridays, and what it delivered on Thursday was more or less a directive for both parties to return to the Appeal Court. As facts on ground became clear that Innoson’s claim on social media was completely false, the embattled businessman moved to silently delete the Fake News Tweet from his company’s Twitter. However, Nigerians on social media did not miss this. 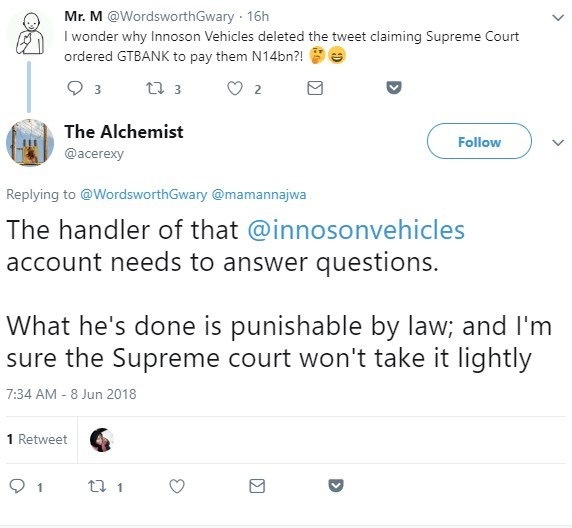 “I wonder why Innoson Vehicles deleted the tweet claiming Supreme Court ordered GTBANK to pay them N14bn?! ” wrote one Twitter user. “The handler of that @innosonvehiclesaccount needs to answer questions. What he’s done is punishable by law; and I’m sure the Supreme court won’t take it lightly,” another Twitter user said. Handsome British Born Nollywood Actor Arrested For Robbery And Homicide Case. Must Read.